The Acer G257HU offers a decent-sized screen with a 1440p resolution at a budget-friendly price, making it perfect for home or office use. The monitor looks decently unique, but we know the affordability comes with a few cut corners and missing features. Can the Acer G257HU’s image quality make up for the absent creature comforts to make it a highly recommended budget monitor? At a glance, the Acer G257HU looks attractive due to its unique glossy and silver color scheme. The monitor looks classy and suitable as a pair for expensive devices such as MacBooks, but the shiny finish is always difficult to protect from dust and scratches. The display is also bezel-free thanks to a dual-stage design which eliminates gaps between the border and the screen. Only the molded bottom strip is thicker since it houses the clean Acer logo and the OSD buttons underneath. By now, we’re already expecting manufacturers to apply a joystick instead of tactile buttons for OSD control. 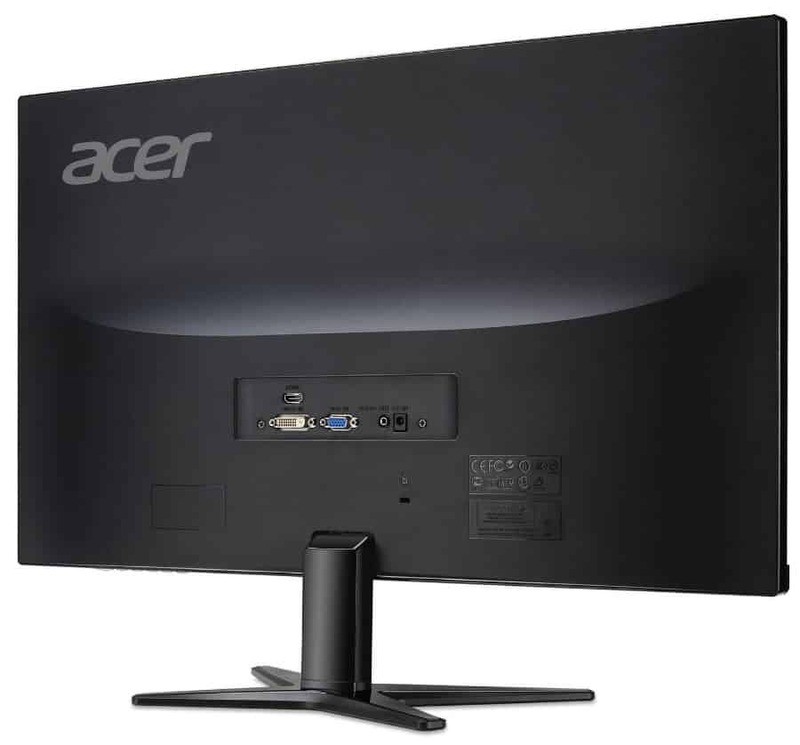 However, since the Acer G257HU is a low-end model, it can only employ the latter which takes time to get used to. The Acer G257HU is amazingly thin due to a modest bulge at the rear of the chassis. This form would make the display ideal for flush or wall mounting, but sadly, it doesn’t come with a VESA bolt pattern. This feature is another option Acer missed for this product which would boost its sellability due to the popularity of multi-display setups. Another let down is the tilt-only stand with a twenty-degree range that’s fixed to the chassis. While build quality is reasonable and the monitor stands firm, we still would prefer to mount the monitor. Acer should refresh this model so it can cover a wider audience of users who are looking for an affordable display with good value. At least, the I/O panel on the Acer G257HU is sufficiently equipped to accommodate the usual mix of devices. The layout includes a port each for DisplayPort 1.2, HDMI 1.4, and DVI-D for video inputs. There is also a headphone out port that has adjustable volume, but there are no built-in speakers with the package. 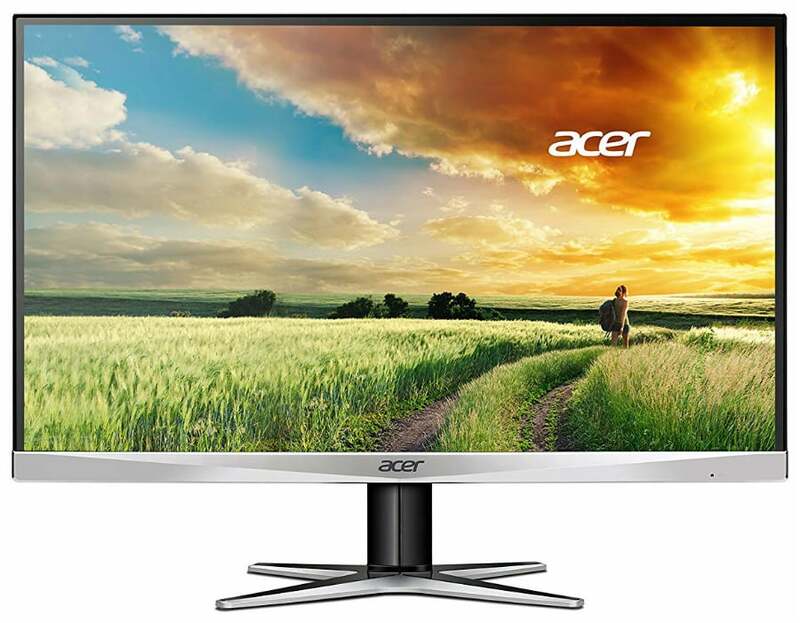 The Acer G257HU offers a 25-inch IPS panel with a 2560 x 1440 resolution, 60Hz refresh rate, and a 4ms response time. A flicker-free backlight with a 350cd/m2 max out and 1000:1 contrast ratio are also specified for the display. The first comment we can give is the screen looks crisper than the usual due to the tighter pixel pitch, but it can make text look tiny and difficult to read. The Acer G257HU’s IPS panel can produce 99% of the sRGB gamut, indicating that it is capable of ideal color accuracy. Higher-priced monitors like the AOC Q2781PQ can offer a slightly lower 97% gamut volume, while other budget offerings even struggle to breach 95%. Default color on the Acer G257HU isn’t impressive because of the massive amount of errors, equating to a color dE of 4.7. The image looks a bit bluish, especially when viewing white backgrounds and applications. The monitor’s Gamma could also use some improvements at 2.0 since it makes the images look washed out. However, the Acer G257HU does respond to calibration with a colorimeter exceedingly well. Color accuracy can be improved to deltaE .6 and a color temperature that looks more natural and closer to the ideal D65 standard. Gamma will also follow the ideal track much closer at 2.19 which should balance the vibrancy of the display. The Acer G257HU’s contrast, on the other hand, is fantastic at 1400:1, adding a nice depth to darker colors. The screen’s grayscale performance is also on the high side, but the black uniformity suffers due to bleeding. The monitor isn’t ideal for lights-out gaming or movie enjoyment, but for everything else such as browsing, you should be fine. Of course, this aspect changes or varies between unit to unit since perfectly correctly manufactured IPS panels are still rare. However, we wish that the Acer G257HU’s panel quality was better since the backlight is decently powerful with a max output of 360cd/m2. The response of the WLED light to adjusting is refined and sensitive, making calibration a bit more flexible. Gaming on the Acer G257HU is a decent experience, but it’s nothing to write home about. You won’t notice the flaws in games like CS:GO, but cartoony titles like Overwatch or Fortnite will reveal the uniformity issues and the slightly lower vibrancy. Late night gaming where most of the action happens suffers the most due to the bleeding issues which affects the panel’s blacks and darker tones. At least, the Acer G257HU is responsive enough for console or PC gaming since it’s input lag tops averages at 9ms. The IPS panel can also handle motion quite well for a 60Hz display since ghosting and blurring are almost non-existent. The only real limitation of the screen for gaming is its low refresh which won’t extend to 144Hz at this price point. Finally, the Acer G257HU does not include FreeSync to reduce stuttering and tearing to zero. 1440p 60Hz isn’t challenging to run nowadays, but mid-range machines and the Xbox One consoles could utilize the technology to improve the visuals. Acer missed another selling point here since the monitor is readily compatible and the tech is free anyways. The Acer G257HU offers a decent image output once you calibrate it, but it’s flaws eliminate it as a suitable candidate for popular applications. The monitor’s out of box performance doesn’t add value since tweaking the settings is critical to a pleasurable viewing experience. The monitor’s size, proportions, and price make it ideal for multi-display setups, but the limited ergonomics and the lack of VESA mounting got in the way. However, the monitor is great for gaming not because of its image quality, but due to its excellent responsiveness. The input lag of the monitor virtually means there will be no delays, plus the IPS panel handled motion such as swipes and running admirably. If you need a cheap monitor to upgrade your viewing resolution or a secondary display to increase productivity, the Acer G257HU is a practical choice.